T H E F A C E O F T H E T H E R E S T I S H I S T O R Y Meet golf's first ever CNC precision milled forged titanium face with COBRA E9 TM technology. Our thinner face creates speed and distance that our competitors would prefer you didn't hear about. 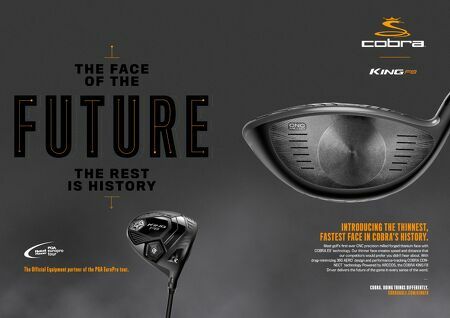 With drag-minimizing 360 AERO TM design and performance-tracking COBRA CON- NECT TM technology Powered by ARCCOS, the COBRA KING F8 Driver delivers the future of the game in every sense of the word. I N T R O D U C I N G T H E T H I N N E S T, FA S T E S T FA C E I N C O B R A ' S H I S T O R Y. C O B R A . D O I N G T H I N G S D I F F E R E N T LY. C O B R A G O L F . C O M / K I N G F 8 T h e O f f i c i a l E q u i p m e n t p a r t n e r o f t h e P G A E u r o P r o t o u r.